Project Open Hand prepares more than 2,500 life-sustaining meals with love every day to help people fight illness and cope with the challenges of aging. We also provide healthy groceries to more than 200 clients a day, who visit our two grocery centers. 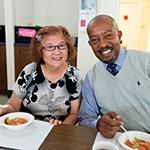 For Seniors and Adults with Disabilities: We provide warm, nutritious lunch to seniors (age 60+) and adults with disabilities (age 18-59) at locations throughout San Francisco. Learn about our Community Nutrition Program. For People Living with Critical Illness: Through our Wellness Programs, we provide nutritious, medically-tailored meals and groceries for pick up in San Francisco and Alameda County. For clients who are homebound, we offer home-delivered meals. Our registered dietitians support and counsel clients to help them feel better by eating right. Learn about our Wellness Programs. Download our Wellness Programs Application Form.